Based on his sturdy physique, his charming good look and that inner confidence that quietly exudes from his boyish demeanour, I would very much like to think that he fits aptly into the persona of Leo Ascendant. Not forgetting that he stands tall at about 1.83 metres and his presence has never been easily missed wherever he goes. He is determined to win and competitive by nature, said his friends. And most of the time I see that luck is with him. This is due to the blessing of very strongly positioned Jupiter which is the 5th house lord – the ruling planet of the house of gaming and competitive sports. The Mars inside Gemini in his first house is likely to add on to his never-give-up fighting spirit as Mars is like a soldier that never rest. As I am not able to find out his exact birth time from the internet, I have to rely on his looks, height, built and behavior and reverse engineered it so that hopefully I could derive the hour of birth that is as close as the actual one. 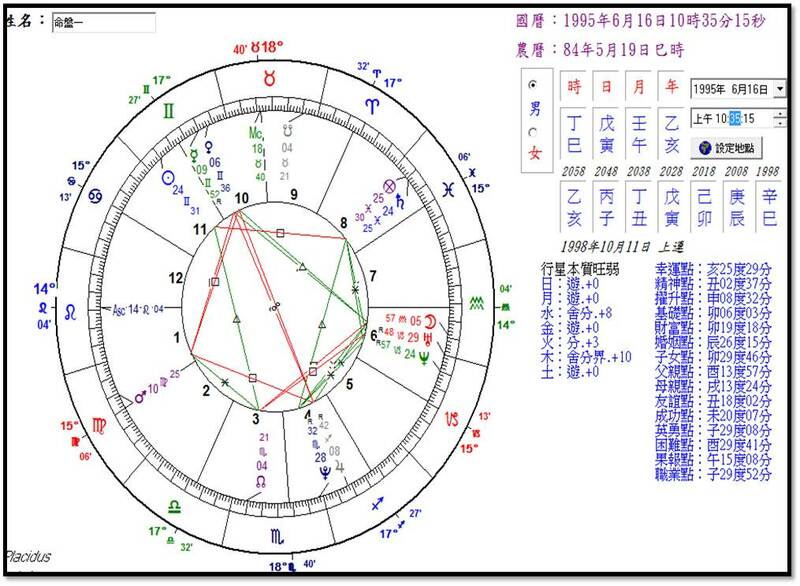 In this case, I would like to suggest that his Astrology as well as BaZi charts are likely to follow below diagram. Let me now focus on his Bazi. He is a Wu earth day master born in fire month and this makes him a Direct Resource structure – one of the 4 Gentlemen as mentioned in Zi Ping classic (四善). The presence of positive Direct Officer and 7 Killing elevates this chart into a Success Structure (成格) and this implies such person is able to enjoy good fame and status in the society. Remember, this is known as Guan Yin Xiang Sheng Ge (官印相生格). Officer and Resource always need to go hand in hand for success to take place. From the news, we can see how enormous the supports are coming from the parents. Both parents shower him with unconditional love that goes beyond words. And I do believe that he reciprocates it by working extraordinarily hard so as not to disappoint them. If you now take a look at his Bazi again, you can see that both father and mother stars are nicely located in the parental palace. This is awesome. Such placement of stars usually suggests that the person will inherit money from the parents. It is actually quite lucky for him that the game falls in August – Bing Shen month – when the annual luck pillar of Bing Shen effectively kicks in based on our Qi flow method (气流法). If it were to fall onto the month that carries the earth stem or earth branch, then I am afraid he may not be able to walk away with the gold medal. Bing fire has given him very good support and Shen metal has propelled him to excel in competition 食神泄秀，才华展露 (Eating God unleashes his talent). I just want to say that you have made us Singaporeans so damn proud of you and I am really very moved by your success. May the qi always be with you. NB: If you are interested in our Bazi Semi Pro course this coming weekend on 20 & 21 August 2016, do click here to find out more or email academy@destinyasia.com.sg to Mr Lester for course fee and other info. Thank you.